Brown, crumble and drain sausage in large skillet. Discard grease, keeping just a small amount in skillet to saute seasoning vegetables. 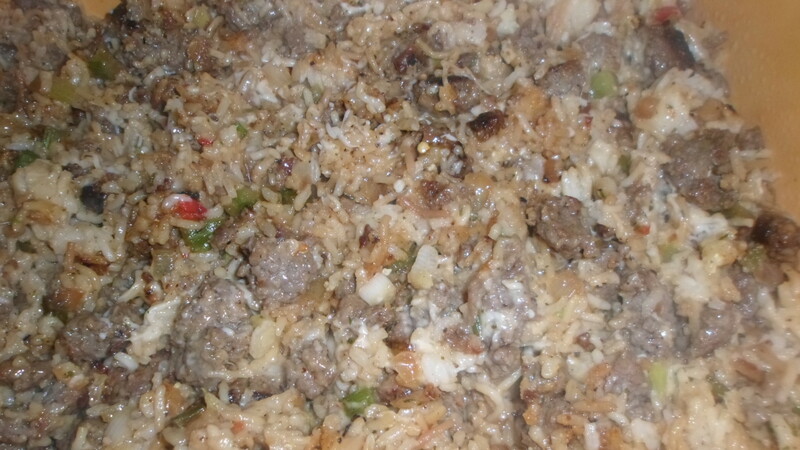 Add in rice and mix well. 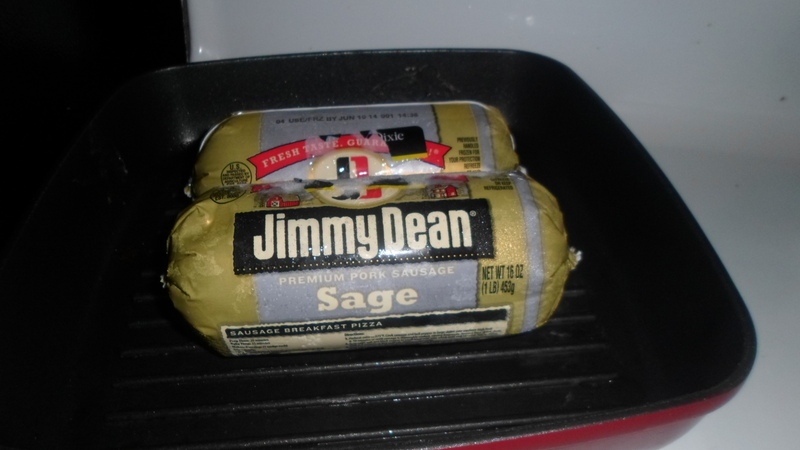 Return sausage to skillet mixture. Add in 1 c. shredded cheese. Pour mixture into lasagne pan that has been sprayed with cooking spray. Mix Bisquick, milk and eggs and pour over sausage mixture. At this point, you can refrigerate for up to 24 hours. In the morning, cook at 400 F for 35 minutes or until set. Sprinkle remaining cheese on top and cook 5 minutes more. Mix all ingredients except meat together. Mix into meat using your hands. I originally considered using bread crumbs if it was too wet, but didn’t end up needing any. They say not to overwork meat on every cooking show I see, so I wondered why and looked it up. It says that the heat from your hands melts down the fat and affects the flavor, which I never really noticed. You can always do a preliminary mix with a fork and use your hands towards the end. Shape into meatballs about the size of golf balls. Bake in casserole dishes sprayed with cooking spray. Drizzle with olive oil, if desired. Cook at 350 F approximately 50 minutes or until internal temperature reaches 165 F.
I found this recipe when I was looking for ways to use up leftover rice. Once the meatballs are cooked, they can be put in a container and frozen for future use. I drained the juices out of the casserole dishes and turned the meatballs over, crispy side down, and then poured marinara over them and sprinkled them with cheese and put them back in for the cheese to melt and broiled at the last minute for it to get bubbly. We had a salad on the side, since the rice in the meatballs gave us enough starch. The salad was baby greens with grape tomatoes, olives and garbanzo beans.